I’d been looking forward to this holiday for ages. Every year I get to February/March time and always wish I’d booked some time off for a bit of winter sun before too much SAD sets in due to the neverending dark, cold days and long nights of British winters. This year I convinced a friend that she should come to Tenerife with me – “Winter sun!” I promised her. “20 degrees C even in March!”, “There’s a volcano we can climb!”. 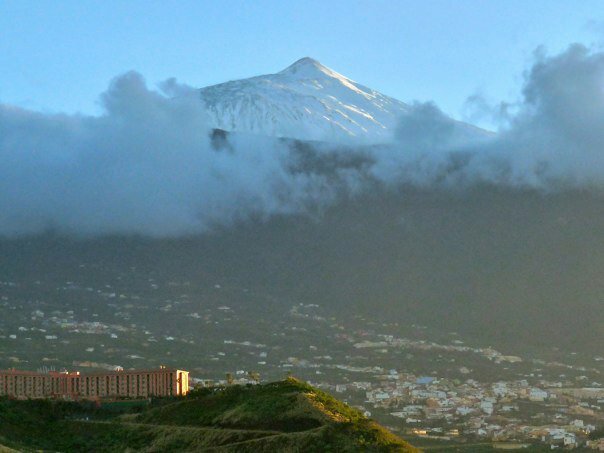 I knew that would do it – Kirsty and I booked our holiday to Tenerife – home of winter sun, the third largest volcano in the world and some great climbing spots. As our departure date drew closer we got more and mroe excited. I packed a week early and then unpacked and repacked. It’s been such a long time since I felt how warm 20 degrees was that I can’t remember what I should be wearing. I opted for covering all eventualities “just in case”. Which was lucky because it rained. A lot. We arrived late Saturday night, had a lovely pizza and piled into bed, eager for the next day’s warmth on our winter bones. Sunday morning was beautiful! We stocked up on food, went for a walk along the sea front and through the town. ﻿﻿﻿And then it started to rain. “It’s ok” we thought, “we’re English, we’re used to a bit of rain” and so the next day we put on our best stiff upper lips and our handily packed wet weather gear and we got in our little hire car (Peugot 207) and decided to drive up to assess the parking situation for our Teide volcano climb on Wednesday. The mist got thicker and thicker the higher up the mountain we drove. Our ears were popping. The car park was at 2000m and apparently we would start to feel the altitude in terms of feeling breathless at that height. Unfortunately we didn’t make it that far. At about 1400m the road was closed due to snow and ice at higher altitudes. We thought it would be better to turn back. The rain by this point was absolutely torrential. The sky was sheeting water like I’ve never seen – not even in the rainforest! The drains couldn’t cope and were overflowing, with waves of brown muddy water pouring off the hills and down the roads, along with large numbers of pebbles and small rocks. It was a very careful drive back down the mountain side. Every time we went over the carpet of gravel that was by now covering some portions of the road I felt like the car wheels were sliding under me. After a long, slow drive we got back to the apartment and could relax. But it was still raining and it rained pretty much until Thursday night. Torrential downpours. Every day. Neither of us had ever seen anything like it! 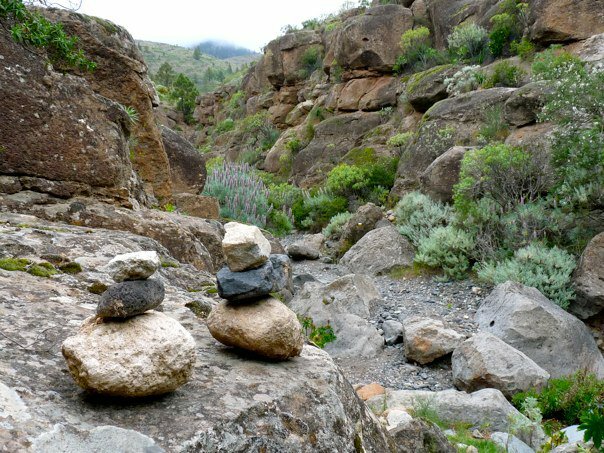 Over the next few days we read and chatted and ventured out when we could, to get food, to go for a short walk or for a drive, but the main object of our trip – to climb Mount Teide – had been thwarted, and we were gutted. Instead, we drove right around the whole island, which is beautiful, even in the rain and mist, and visited salt water pools, small mountain villages, the Jardin Botanico, and beautiful Arico Gorge (I forgot my climbing shoes so no climbing for us!!). Whilst at Arico Gorge we met a guy who was living in a tent, which a very cute 5 week old fluffly black puppy called Odin. No doubt, with a name like Odin, he will be fearsome one day but when a puppy’s front legs stop running and it’s back legs don’t, it’s not hugely scary. We drove over 500 miles in a week – not bad for an island thats only 50 miles by 56 miles wide. ← London. Love it or loathe it? Oh no, what a pity about the volcano! You don’t expect weather like that, do you (unless you’re here in the UK)?! Tell me about it! We have to go back to conquer that volcano!!! Sorry I’ve been really rubbish at replying to comments! !